1.How Forward mounting Ultrasonic Detector works? Thirdly, there are LED indicators in the front of every parking space, which will keep green if unoccupied and turn to red when occupied. 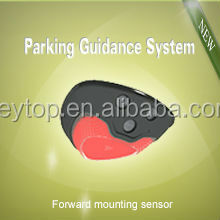 So the driver can learn which parking space is available from the color of LED indicators.